This adorable 2-page layout is yet another artsy project that we created at the Close To My Heart annual convention this past June. Can I just tell you how fun it was to use brand new products that were not yet released? It was super exciting! 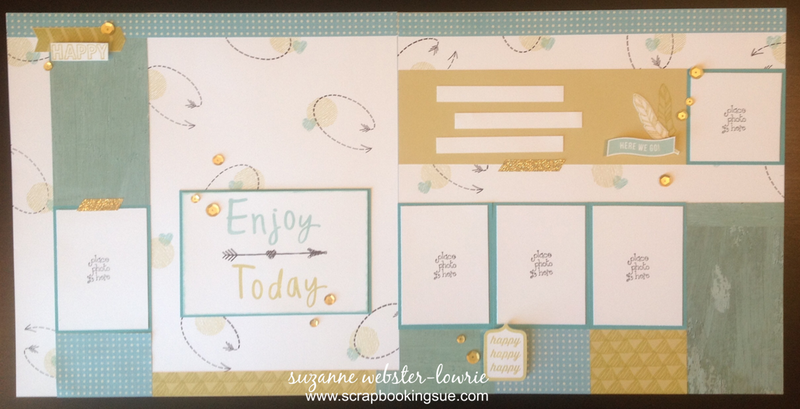 This layout used a wealth of new products (all of which are now released), including 4 brand new stamp sets! Yes, there are 4 sets represented on this layout! Also, there are patterned papers from 2 different paper packets. Both layouts used White Daisy cardstock as the base pages, patterned papers from the Seaside Paper Packet and Wanderful Paper Packet, and some Crystal Blue cardstock as photo mats. All of the background geometric shapes and arrows were hand stamped with the “Here We Go” and “Glitter Glam” stamp sets. 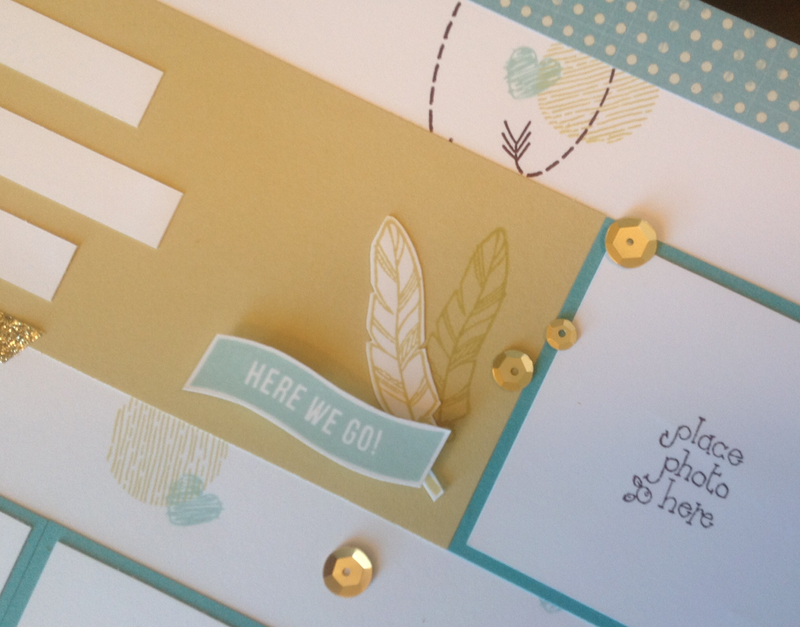 The “Happy” sentiment was stamped with the “Lovely Birds” stamp set, and the arrows were from the “Here We Go” set, stamped onto Flaxen cardstock. 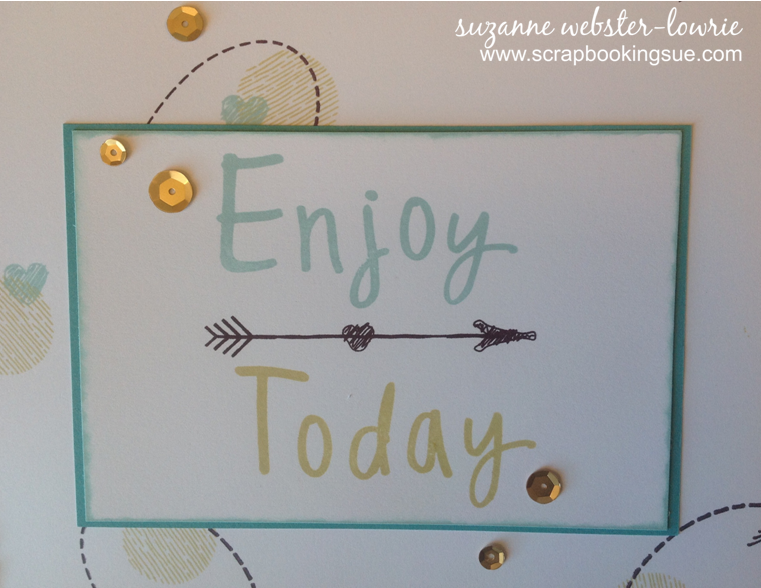 “Enjoy Today” was stamped in Glacier and Flaxen inks with a new stamp set called “Handwritten Print,” which is an alphabet set containing upper and lower case, as well as special symbols. The long arrow in the center is from the “Glitter Glam” stamp set. The Flaxen cardstock on the bottom of this page was plain, but I stamped it with a repeating pattern of traingles from the “Glitter Glam” set to create a patterned background. The “happy, happy, happy” stamp is from the “Here We Go” set. Both of the feathers are from the “Lovely Birds” stamp set. One was stamped directly onto the Flaxen cardstock and the other was stamped onto white and then fussy cut and adhered to the paper. Each page was embellished with Gold Shimmer Trim and Gold Sequins for some shine! « NEW “Stretching Your Workshops” Program!